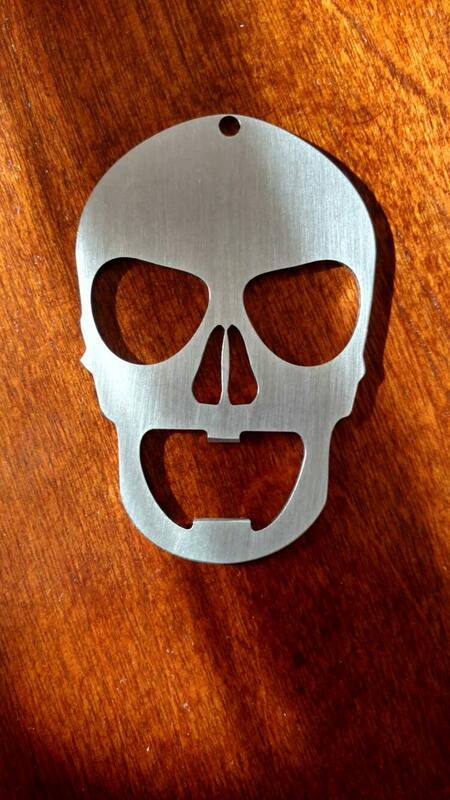 Laser cut and stone finished stainless steel bottle opener and keychain in the shape of a stylized human skull. We call it - "THE SMILING SKULL". It looks really cool and feels nice in your hands. The best part about this gadget is that it opens bottles really nicely. The material is 14ga thick stainless steel and it is virtually indestructible. It will never rust, corrode or break under normal use. You will not find them anywhere else - this is our original design and we are the sole manufacturer. These quality key rings are cut using high precision CO2 lasers by American craftsmen. Later, we stone finish them to a sleek matte finish. They feel nice in your hands and are designed to last a lifetime - if not longer. Dimensions 3.3" high and 2.25" wide. Punisher bottle opener stainless steel - Skull Keychain.